Hybrid vehicles have quickly gained popularity over the past decade, and the Prius is at the head of that revolution. If you are a proud Prius owner and need to find a home for your service and repair needs, The Hybrid Garage would love to be that place. We are the trusted alternative to dealer service because of our commitment to great customer service and fair prices on all of our repair work. Hybrid vehicles have special needs that are different from a standard gasoline engine. Our team of A.S.E. 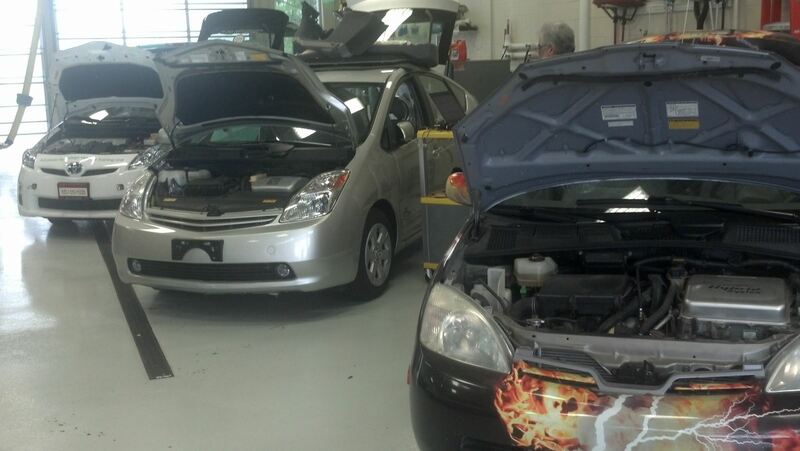 Certified Technicians are well-educated in working on these vehicle and will bring their knowledge to your Prius. We work on all different Prius vehicles, including the Prius Two, Prius Three, Prius Four, Prius Five, and the Persona Series. Any work that you have us do on your vehicle will be backed by our 3 Years/36,000 Miles warranty. For anything from a simple oil change to a major repair of vital engine parts, Hybrid Garage has you covered. There is no job too large or too small for our talented team of technicians. We love building long-lasting relationships with our customers, so ask around and you will likely find Prius owners that have been with us for years. Call or come by today and speak with any of our friendly staff about what we can offer your Prius in the way of service and repair.